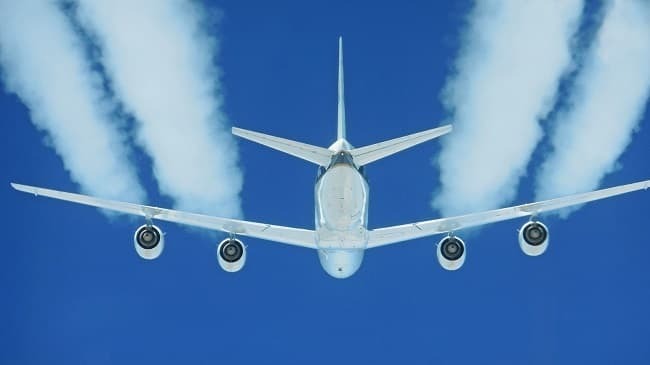 Emissions from Jet engines release around 800 million metric tons of CO2 in our atmosphere annually. Not only that, aviation related emissions majorly contribute to particulate pollution which leads to increase of world’s average temperature. Recently, NASA published a research in this week’s science journal, Nature, claiming to have success in reducing soot by 70 percent in Jet exhaust. A team of scientists achieved this by utilising a 50-50 mixture of biofuel and normal jet fuel in a NASA DC-8 aircraft. The data was recorded by small chase crafts flying 100 to 500 feet behind to measure composition of exhaust fumes. The experiment was repeated number of times with different composition of fuels in varied ratios. A mix of hydro-processed esters and fatty acids produced from camelina plant oil showed amazing results with emission cut ranging between 50-70 percent. Researchers focused their study on formation of persistent contrails. Contrails are direct result of high soot content in jet exhausts. These are formed when engine fumes mix with cold air, which is quite common at flight altitudes, and leave behind a trail of clouds made primarily out of ice crystals. Although, a trail of clouds behind a plane looks cool, but research shows it can adversely affect Earth’s environment. Why can’t we use just biofuels into our jet engines instead of a proposed mixture, that may further reduce unwanted stuff from exhaust? Dr. Richard Moore from NASA's Langley Research Center, and who led the research team said, it surely is possible but not with present infrastructure and engines. Most of the engines are designed to function properly only with Jet fuel. With such success in hand, researchers aim to continue the study and will move towards the goal of launching a biofueled supersonic-X plane in near future. I think they really need to think about ways to tap into solar power. If you've to burn something to produce energy, then that's not going to be an everlasting solution for sure. Till then, lets keep our emissions in control. Solar power for planes is a long way to go.